In August 2011, the Department of Health and Human Services issued a federal mandate that required employers to provide services like the week-after pill in their health insurance plans, free of cost. The mandate did not exempt religious non-profits with religious objections, like the Little Sisters of the Poor, a Catholic order of nuns that run homes for the elderly poor across the country. Despite the Little Sisters’ repeated requests for protection from the mandate, the federal government refused to grant them reasonable protection from the rule. Faced with ruinous fines if they did not comply with the mandate, the Little Sisters asked the court for protection against the unconstitutional mandate, arguing that the government could easily achieve its policy goal without forcing them to violate their deeply held religious beliefs. After years of litigation, the Little Sisters won their case at the U.S. Supreme Court in May 2016. Their original case was finally resolved at the U.S. Court of Appeals for the Tenth Circuit in June 2018. After years of litigation, the Little Sisters won their case at the U.S. Supreme Court in May 2016. Their original case was finally resolved at the U.S. Court of Appeals for the Tenth Circuit in June 2018. And on November 7, 2018, the federal government issued a final rule creating a protection for religious ministries like the Little Sisters while offering alternative means for women to obtain free contraception. Little Sisters of the Poor v. Azar. The Becket Fund for Religious Liberty (n.d.). Retrieved from https://www.becketlaw.org/case/littlesisters/. Little Sisters of the Poor v. Azar. (Apr. 04, 2019). https://www.becketlaw.org/case/littlesisters/. "Little Sisters of the Poor v. Azar." The Becket Fund for Religious Liberty. Accessed [Apr. 04, 2019]. https://www.becketlaw.org/case/littlesisters/. In August 2011, the Department of Health and Human Services (HHS) issued a federal mandate as part of the Affordable Care Act. The mandate required employers to provide all FDA-approved contraceptives in their health insurance plans, including the week-after pill, free of cost. Despite the obvious religious liberty issues with a contraceptive mandate, HHS included only a narrow religious exemption—one that did not include religious non-profits like the Little Sister of the Poor, a Catholic order of nun that runs homes for the elderly poor across the country. The Little Sisters’ Catholic beliefs about life and contraception meant that complying with the mandate was impossible. The Little Sisters initially tried to communicate their concerns with the federal government. In good faith, they believed that the government would grant them an exemption. After all, HHS already exempted thousands of other secular employers whose plans were “grandfathered” in under the new rule—including Exxon, Pepsi Bottling, and Visa—and even exempted the healthcare programs for the U.S. military. Instead, HHS doubled down, continued to refuse to exempt the Little Sisters, and threatened them with ruinous fines of tens of millions of dollars if they did not comply with the mandate. In September 2013, represented by Becket, the Little Sisters of the Poor went to court against the federal government to protect their religious freedom. After a district court ruled against them, the Little Sisters appealed to the U.S. Court of Appeals for the Tenth Circuit, which again ruled against them. However, on December 31, 2013, Justice Sotomayor of the U.S. Supreme Court granted the Little Sisters emergency protection against the rule, temporarily protecting them from fines. The entire Court then granted the Little Sisters a longer-term injunction in January 2014, and sent the case back to the Tenth Circuit for reconsideration. But after the Tenth Circuit ruled against the Little Sisters once more, the U.S. Supreme Court again agreed to review the Little Sisters’ case. In March 2016, the U.S. Supreme Court heard oral arguments in Zubik v. Burwell, a consolidation of six cases brought by religious non-profits against the mandate, including the Little Sisters of the Poor. At the Supreme Court, the Obama administration admitted to the Court that the mandate required the Little Sisters’ participation and the use of their health plan, and that the government could provide contraceptive services in other ways that didn’t require using the Little Sisters. These key admissions cleared the path for the Supreme Court to find a solution. In May 2016, the Supreme Court unanimously overturned the lower court rulings against the Little Sisters, ordered the government not to fine the Little Sisters, and instructed the lower courts to provide the government an opportunity to find a way to provide services to the women who want them without involving the Little Sisters. The Supreme Court decision was a victory, but one that would take another two years to reach completion. In May 2017, President Trump issued an Executive Order directing HHS and other federal agencies to protect the Little Sisters of the Poor and other religious non-profits from the mandate. On October 6, 2017, the government issued a new rule with a broader religious exemption. In June 2018, the Little Sisters’ original case was finally resolved with an order by the U.S. Court of Appeals for the Tenth Circuit. And on November 7, 2018, HHS issued a rule  finalizing the Little Sisters’ religious exemption. 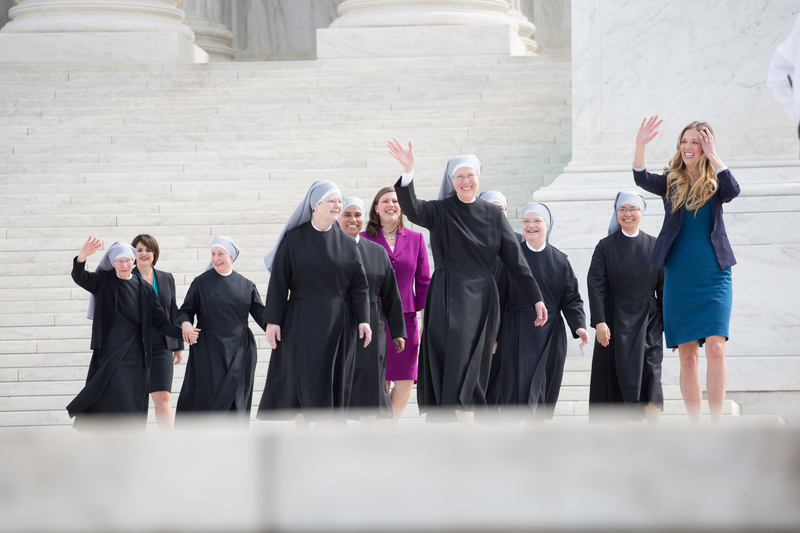 The unanimous decision by the Supreme Court and the President’s executive order were big wins for the Little Sisters. But that does not mean anyone lost. As the Little Sisters had argued all along, the solution in no way bars the government from providing these services to women who want them. In fact, any alternative delivery method the government chooses could likely be applied not only to women in religious plans, but to the tens of millions of women in corporate and government plans HHS had previously exempted from the mandate. In the end, the government was able to both provide the mandated services free of charge to any woman who wanted them and accommodate the Little Sisters’ religious beliefs. HHS Mandate cases: Winning the HHS mandate cases sets an important precedent, confirming that federal agencies cannot unnecessarily force religious people to violate their beliefs in order to further a government goal. Religious communities: Religious communities have the right to organize and operate according to their beliefs without the government discriminating among sincere religious. Individual freedom: Religious individuals and organizations are free to follow their faith in all aspects of their lives, including in the workplace and not just in houses of worship.